Spring. A new season. A new friendship blossoming. Shorts weather returning. It’s been a pretty chilly winter even for Sydney, and no doubt the Abrutzo clock still reads -80C in Melbourne. 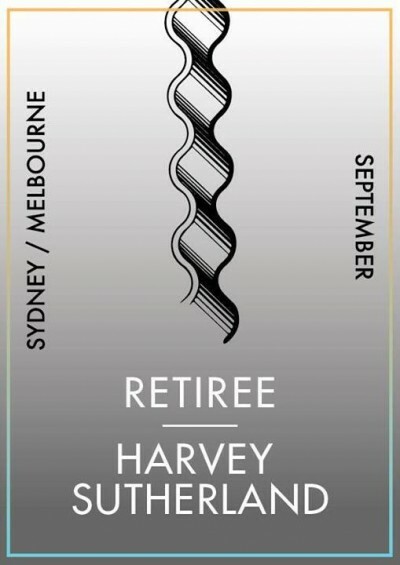 The cold weather provides impetus to get things done however, and to celebrate the oncoming seasonal freshness Retiree and Harvey Sutherland are hopping in the van for a two-date tour of their respective hometowns. With our recent single, “Altruisme” drifting into your nostrils before the first scent of wattle, Pelvis will be weaving it in with our new live material. Off the back of his latest EP, released on Echovolt Records, our hard-working friend Harvey Sutherland will be joining the family, shedding new light on forthcoming EP material, expected to be in full bloom & ready to impress, once again. Joining us in the shedding of layers will be World Champion, McInnes & Pelvis. Remove the hot water bottle from between your legs and put that second doona away, you won’t be needing either.